I redesigned the website with Prestashop 1.6, particulary focusing on how to improve the purchase process. I developed a search engine in order to find a specific product quickly and easily. Origin Jantes sells rims from many brands. The goal was to make a website as user-friendly as possible for the visitor so that he could find quickly the right rim for his car. The best solution we found was to create a specific search engine for this website directly connected to PreshaShop with an API. 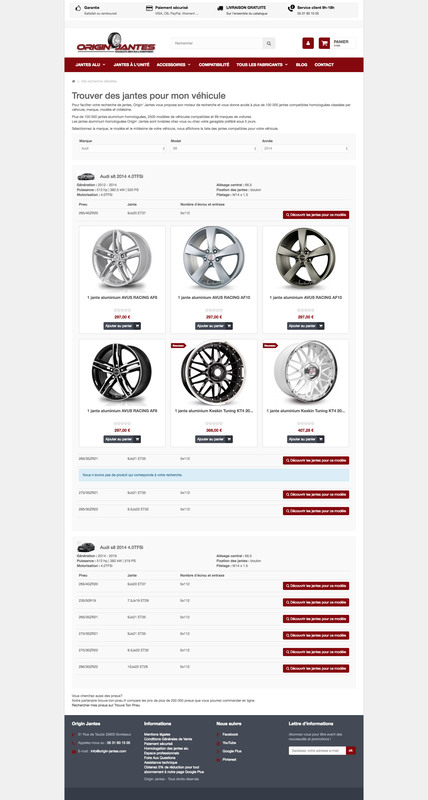 The customer can select the informations related to his car and the website would show the right rims. I want to thank Michel Dumont (http://michel-dumont.fr) who worked on this project with me. Professional, as usual.